StP02 Franceville Ost, K.V.U.Gr Riva-Bella, K.V.Gr Caen. StP02 set between the D514 and the sea, now a camping site and sand dunes. 2 x Anti tank walls. 2 x L413 ammunition bunker for a 3.7cm AA battery. 1 x R105b machine gun casemate L/H. 1 x R105c machine gun casemate R/H. 3 x Vf2a's gruppe shelter. 1 x Vf Skoda casemate. 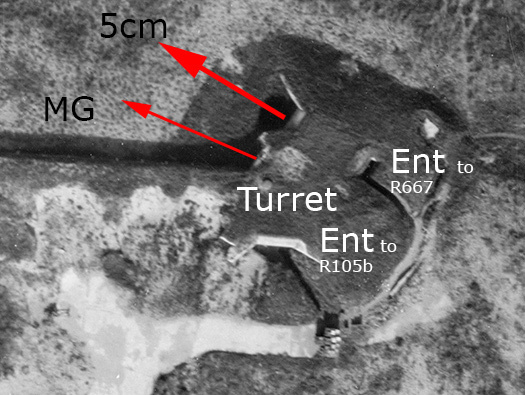 1 x R634 6 embrasured turret bunker. 1 x Vf6a observation post, splittersicher (splinter-proof). 1 x ringstand for 5cm KwK. 1 x Searchlight + Maschinenstand. 1 x R667 casemate for a 5cm KwK Pak gun..
1 x 4.7 Skoda Pak39 (t). 2 x 3.7cm Flak 18. 2 x Pz.T. FT-3.7cm KwK 144(f). L413 ammunition bunker for a 3.7cm AA battery. Vf6a observation post, splittersicher (splinter-proof). 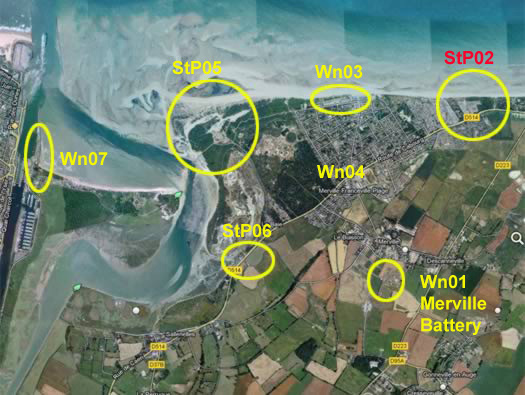 This is a plan of all the Wn/StP's in this area. Possibly a Spitfire passing over taking pictures all the way around the Atlantikwall coast. Loading cameras onto a Spitfire. 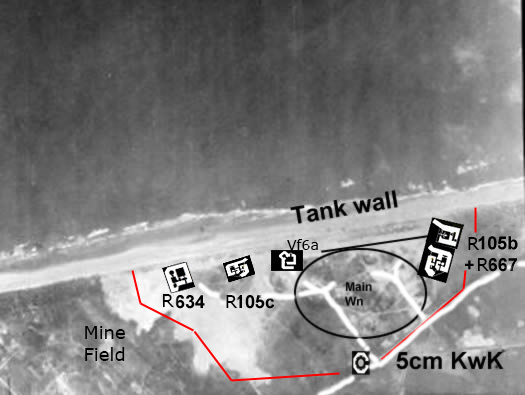 Plan showing where Allied intelligent´s expected beach defences and minefields. 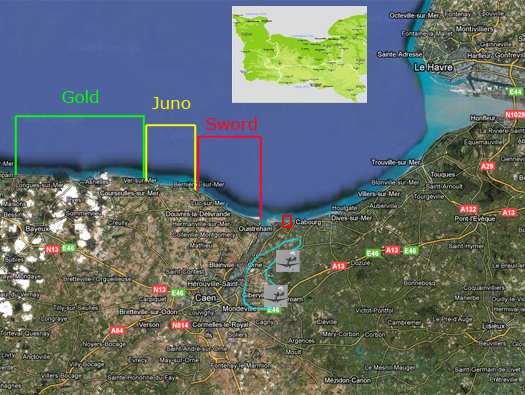 Plan of the outer defence. 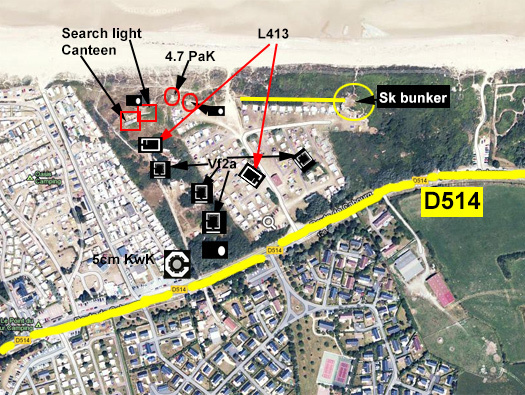 A quite large area to defend and lot a bunkers. R634 6 embrasured turret bunker 20P7 turret/dome for an Mg.34. 20P7 turret/dome for an Mg.34 6 embrasured turret R634 bunker. R105b & an R667 bunkers attached. A double bunker with an R105b with only an Mg34 behind a steel plate and added to it an R667 with a 5cm KwK L/60 Pak. R667 casemate for a 5cm KwK L/60 Pak . 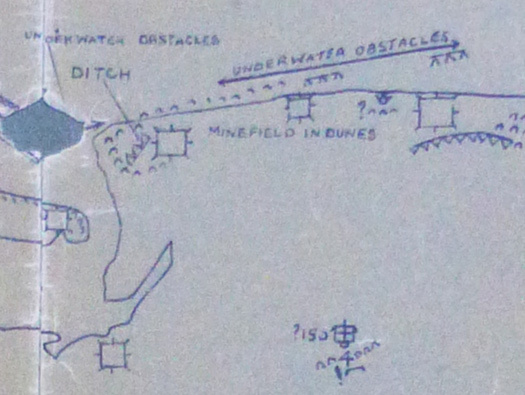 Plan of the double casemate. A 9AP7 dome (turret) the type that may have been on the roof of the R105b. Inside the defences laid out now in a camping site. I have only visited the Vf 5cm ringstand. 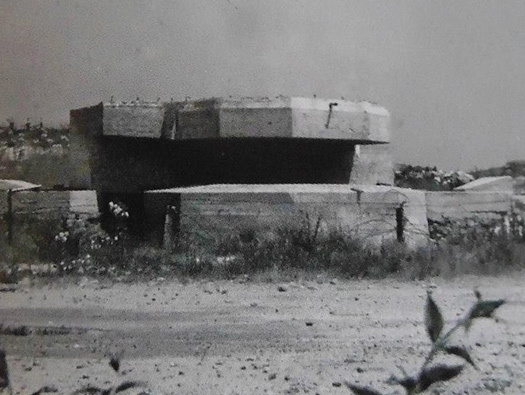 L414 ammunition bunker for 3.7cm Flak. Ringstand for a 5cm KwK Pak L/60 gun. Facing due south, this bunker covers the rear of StP02 and the road that runs east/west. D-Day this StP would have probably had to take on a few stray parachutists falling wide of their DZ's. 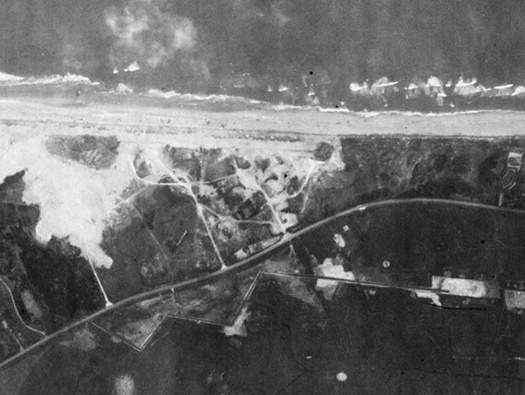 Then watched as Wn01 Merville batterie was bombed-taken-lost and several days later retaken. Before they too were gradually pushed out by Commandos driving up along this road. This ringstand has a lid built over it to give it extra protection from splinters but it stops it being able to fire in all round defence. The niches are for ready ammunition. D-Day early in the morning. 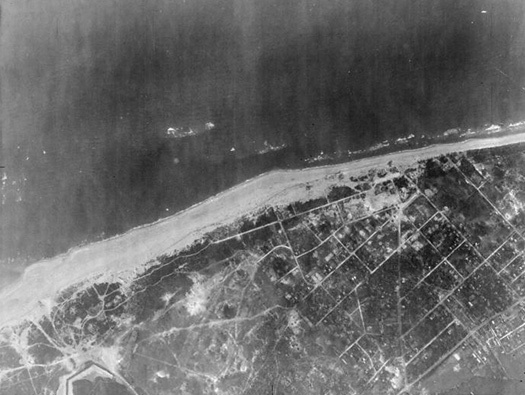 How it looked in 1945. A large anti-tank ditch running behind the defence.